"They were a wall unto us both / by night and by day"
Newbury Baptist Church War Memorial – Dedication Service, 5 Oct 1921. It was a notable address which Lieut-Col the Rev F J Walkley, OBE, MC, delivered at the unveiling of the memorial tablet to those men associated with the Newbury Baptist Church and its village missions, who laid down their lives in the Great War, and one which should be read by the whole town. It was a call to the nation to realise and live up to the legacy which those men left behind. Their soldiers had high ideals, they had a simple faith. They desired that the divisions of Christendom might be broken down, that class and social distinctions might vanish from the land; that England might be a fit place for men to live in. The address was a call to those left behind to live up to these ideals. 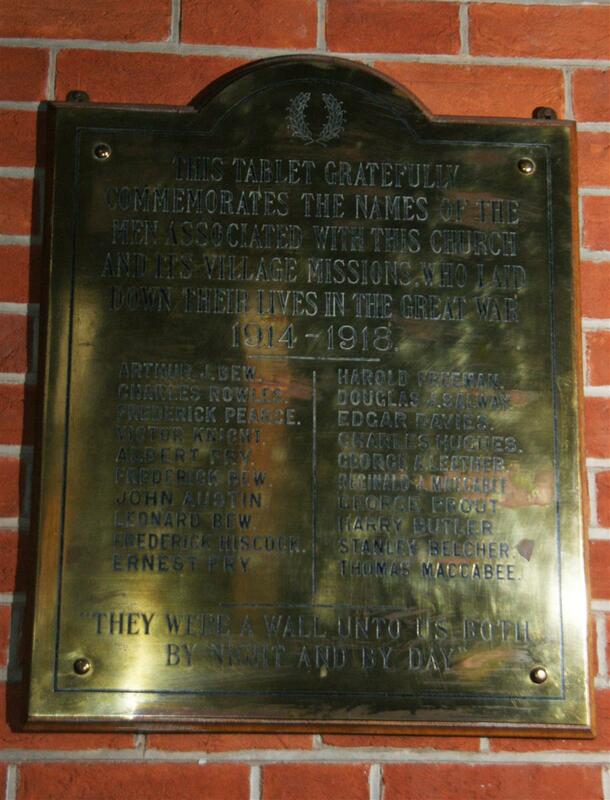 "This tablet gratefully commemorates the names of the men associated with this Church and its Village Missions, who laid down their lives in the Great War, 1914-1918." Underneath were the words. "They were a wall unto us both by night and by day." The tablet was placed for its unveiling underneath the pulpit, but it is to be erected permanenty in the vestibule, so that all who enter the Church may see it. There was a large congregation at the service, which was of an inspiring nature. The hymns were of a militant nature, and being set to well-known tunes, the singing went with a swing. They were " Fight to good fight," "Soldiers of Christ arise," whilst the service concluded with "For all the saints." The Pastor, the Rev C V Pike, conducted the service, and offered the opening prayer. Tow ex-service men read the lessons, Mr C Lipscombe, who lost an arm in the war, and Mr A P Morton, whilst two others, Mr C Freeman and Mr C Maccabee performed the unveiling, and after Lieut-Col Walkley had read the inscription and names on the tablet, a bugler sounded the Reveillé. Col Walkley, in his address, said he hoped the memorial would cause them to have hearts that were grateful to those 20 men, who were but a small number of the mighty multitude who stood between them and the hosts who fouled the fair fields of Belgium and Northern France. It was no word of exaggeration to say, as was set forth on the tablet, that "They were a wall unto us by night and by day," and for four years they remained that wall until victory was finally achieved by the heroes of their armies. It was in no spirit of adventure, but for the love of their country that those men went forth to their death. It was to make a better England, to make conditions of life better, to make everything in their country rise to a higher plane. Those men fought for ideals, they died for ideals, and, had they returned, he believed they would have been foremost in the ranks of those who tried to attain those ideals. Let no one say that their soldiers were not relligious. They had no place for the ordindary creed of the church, but in the heart of every soldier that fought there was a very simple creed, and it was this: They believed in a good God; they believed in a hereafter; and they believed in themselves; and the majority of their men went to their death with the resolution that they were going into another life, into the presence of that good God. Those men were hopeful that after the war those creeds, which in the awful moment of battle left them cold and could not be applied to the conditions in which they found themselves, would be merged into one simple creed which all men could accept, and the acceptance of which would make all men united who believed in the common good. Those men had a great desire that the division of Christendom might be broken down, and that the Church of Jesus Christ might become one united Church, moving forward solidly for the Kingdon of God. They could not understand those divisions, and they found in the stress of war there was no place for them. Let them live in the spirit of those men who desired an united Church, and let them aim at its accomplishment. Then also those men preached to them the great necessity of co-operating one with another to make their common life all it should be, and what God intended it to be. They realised in the future that if England was to become anything, it could only be by men of all classes, creeds and possessions, whether poor or rich, uniting themselves together and working for the common good. It there was one message that those men voiced, it was for a common unity between masters and men in industrial matters. So in those days, let them not sow divisions between class and class, but let them in their political life and social life graps each others' hands and try to make England greater than it had ever been. The value of their death was the legacy they had received in the inspiration they derived from all that they did for them. Those twenty men would preach sermons to them for many days to come. "They are dead, yet they shall always live." The serice concluded with the Benediction.